I have a very dear and lifelong friend who lives in the foothills of the High Sierras on the California side and more than anything she loves snow at Christmas. Unfortunately (or fortunately all the rest of the winter) she lives at an elevation where snow isn't something that falls and sticks to the ground for days at a time. Still, flurries of snow in the cold of December occurs often enough that she crosses her fingers for a cold snap during the last week of December. So, I've done this card for her as a good luck charm in bringing snowflakes. That adorable fairy image is colored with ProMarkers and, instead of die cutting the image, I die cut the frame and placed it over the image. I have to tell you that I've been hoarding the papers I used here. They have been part of my Christmas/Winter stash for 2 years and I just love them. I can't find them any more so I have kept them as treasured pieces, refusing to use them or give them away. But they just fit this card so perfectly, and she's such a good friend, that I let go and used two pieces of them. The snowflake and snowflake buttons are also treasures but I dug them out and decided to use them. I added dots of Artic Blue Ice Stickles to them, let them dry and then adhered them to the corners. I used regular Stickles (Star Dust) on the flakes in the image and added Frosted Lace Stickles to the snow on the branches and cones in the image. What a sparkly splendor! Oh so very sweet, Connie. pretty papers also. I will keep my fingers crossed for your friend. Everyone should have a little snow on Christmas. Thank you for joining my Snow Angels blog challenge at LunagirlMoonbeams.com! Welcome! Love your sweet little snow angel with her pine cone and sparkly snowflakes, and your shades of blue. So pretty! I understand the paper hoarding logic! lol! Guilty, here, too! That is beautiful blues, and great snow patterns on those pieces! Wonderful card- love the blue DP you used- the image is fab, and I LOVE the idea of die cutting the DP and layering it over the image. We are having an interesting weather year already - 5" ice in Dallas....hmmmmm Maybe your friend will get fortunate after all and see snow! Oh NanaConnie this is just beautiful. Love that image and of course your coloring is fab. Thanks for joining us at Created with Love Challenges. Beautiful!!! I love the snowflake buttons you added along with that wonderful blue color! Very classy looking and pretty. Have fun at the concert! And yes, we always called them Christmas Concerts too. Times change i guess. A beautiful, sultry image and gorgeous card! Congrats on using up your papers and saving them for a good friend! 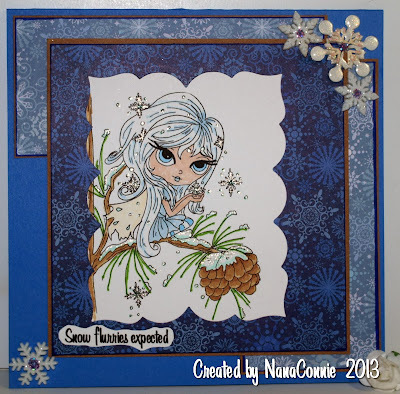 Love this image and the soft colors you used and the snowflake embellishments you used are gorgeous! Such a pretty card! Love those colours and your embellishments - great use of the sketch. What a wonderful card Connie and such a sweet way to wish her luck. Beautiful card, love the blues, the image, the sparkle, the colouring, everything! Beautiful blues and a stunning design, Connie. Just fabulous. Adorable. This is such a lovely image. What a lovely card! Love that sketch and that image! Hi NanaConnie i hope you OK! Sorry i haven't been commenting on you blog recently I've just been doing lots of Christmassy things! Anyway i love your card! It reminds me of Christmas! The image is beautifully coloured and the papers fit perfectly! Absolutely stunning Connie, I will keep my fingers crossed for your friend. Love the image and the beautiful papers. Beautifully coloured too. Hi there, your image is sooo sweet and love how you've put the image behind the frame. 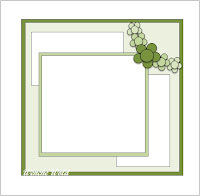 What a sweet and pretty card for your friend!! I hope she gets her snow! We are supposed to get up to a foot tonight and tomorrow! :) I love snow! Beautiful image and I love your added sparkle. This card is so beautiful! I love the blue colors! Thank you for joining Sketchy Colors, and lots of luck! Hi Connie...I love the idea of a fairy bringing good luck to someone - a lovely story. I hope your friend gets her week of snow! A beautiful card, gorgeous wintery colours and hint of sparkle for some magic. Thank you for joining us at Vintage Stamping Challenges. Pretty card, Connie! Love the sweet image and your fab use of the sketch! Thank you for joining in the LEJ Designs Weekly Challenge #83 - 'Festive Fun'. What a really great card. The image is very detailed and looks beautiful the way you've coloured it. The papers are gorgeous and work wonderfully together. I hope you will return and join in more of our future Challenges. Keep an eye out for a few New Year changes over on the LEJ Designs Challenge Blog. So pretty! Thanks for joining us at All That Stickles! Wonderful job! Thanks so much for sharing at Craft Your Passion. PS-Love the kitties in your header. They're adorable! Thank you for linking up at Paper Playtime! This challenge blog is moving to Pause Dream Enjoy beginning Tues, Jan 7. Please bookmark the site and come link up in January! gorgeous card for your friend! Just love the colors that you have used for it! This is lovely. Great snowflake design with the sparkly fairies. Thanks for playing at Top Tip Tuesday and good luck. Hope to see you back tuesday for another challenge. Bettina DT Member at Top Tip Tuesday PS Merry Christmas!! This is gorgeous. I love your image, your papers & those fab little snowflakes. Thanks for joining our Mega Christmas Challenge at Passion For Promarkers.